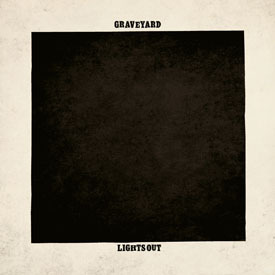 "Lights out" is the follow up to 2011's successful album "Hisingen Blues" Since the release of that album they've seen their popularity soar and have toured and played festivals to capitalise on the album's success. Expectations then for this new album, their third, are high. The band's sound is still heavily influenced by 70s hard rock, and stoner rock influences are also apparent. The music feels darker and a bit heavier than Hisingen Blues, but apart from that, little significant has changed between the releases - after all whan you've got a winning formula it would be madness to change too much. "The Suits, the Law & the Uniforms" has a real Deep Purple sound with a bit of sstoner rock thrown into the mix. It's got a great riff running through it and has a nice thick guitar sound. A great track. The album ends with "20/20 (Tunnel vision)", one of the slower tracks on the album which has more of a bluesy hard rock sound.